Black is a 2005 Indian drama film directed by Sanjay Leela Bhansali and starring Rani Mukerji and Amitabh Bachchan. Black revolves around a deafblind girl, and her relationship with her teacher who himself later develops Alzheimer's disease. The film draws inspiration from Helen Keller's life and struggle. Black was a commercial success, becoming the second highest grossing Indian film worldwide in 2005 and the highest-grossing 2005 Indian film overseas. The movie was inspired by the 1962 movie The Miracle Worker. The film was screened at the Casablanca Film Festival and the International Film Festival of India. It won the Filmfare Award for best film. Time Magazine (Europe) selected the film as one of the 10 Best Movies of the Year 2005 from around the globe. The movie was positioned at number five. Indiatimes Movies ranks the movie amongst the 25 Must See Bollywood Films. The film was premiered in the Marché du Film section of the 2005 Cannes Film Festival.Amitabh Bachchan received his second National Film Award for Best Actor at the 53rd National Film Awards, his fourth Filmfare Award for Best Actor and his second Filmfare Critics Award for Best Actor for his performance and Rani Mukerji won her second Filmfare Award for Best Actress and her second Filmfare Critics Award for Best Actress. A remake of this film was produced in Turkey in 2013 titled Benim Dünyam. 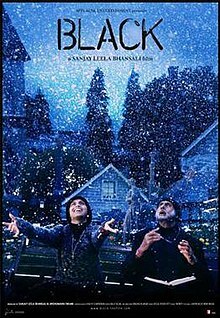 The film begins with Michelle McNally (Rani Mukerji), a blind and deaf woman, visiting her former teacher Debraj Sahai (Amitabh Bachchan), who now has Alzheimer's disease, in a hospital. The film then flashbacks to the past to her childhood. Michelle was a girl who lost her eyesight and hearing after recovering from an illness at the age of two and exists in a black world where she is isolated in the darkness of her own existence, trapped by her inability to see, hear and express. She grows up becoming more and more frustrated by the black and dark world around her, making her a violent, uncontrollable eight-year-old child. Her parents, Paul and Catherine, are at their wits' end trying to control her, until one day the light shines through the end of the tunnel. Debraj Sahai enters their lives, an elderly alcoholic teacher for the deaf and blind, Debraj sees himself as a magician and is a disillusioned eccentric man. He takes it upon himself to bring young Michelle into the light. He uses harsh methods, although always for Michelle's long-term benefit. Initially, his methods are met with disapproval by Michelle's father, who asks Debraj to leave. Although her father thinks he is gone, Debraj stays as the teacher while her father is away on business for 20 days. Her mother grudgingly approves of his continuation given her fear of Michelle being sent to an asylum. By the 20th day, Debraj manages to teach Michelle some words and better manners, but he has difficulty teaching her the meaning of words. When Michelle's father returns, Debraj packs his bags. At the very last moment, as he is walking towards the door suitcase in hand, Debraj gets frustrated with Michelle's continuing insolent behaviour and he throws her into a fountain full of water. Michelle suddenly takes to Debraj's lessons at that moment and begins to understand the meaning. She is able to recognise her mother and father and can vocalise the first syllables of some words small enough for her to understand. The McNallys decide to keep Debraj as Michelle's teacher. Many years later, Michelle has learned a great deal, becoming relaxed and expressive, and she is even able to dance and expertly sign. Debraj convinces the principal of a university to grant her an interview which she passes and gets admission to pursue a Bachelor of Arts degree, the first deaf-blind person to do so at that university. Michelle moves away from home and lives with Debraj and one of her servants. Over the next 2 years, she struggles to gain her Bachelor of Arts degree, failing year after year, but she still maintains her spirit. One reason is that she must rely on Debraj completely for interpretation of the material and studying. This problem is overcome by the Principal of the school preparing the whole first-year Arts course of study in Braille. Another reason for her continuing failure is that her typing skills are lacking and typing is her only way to write down what she knows during exams. However, she also soon overcomes this deficiency through another flash of increased competence when she almost quits the university and gets into an argument with Debraj. At the same time as Michelle suffers through and triumphs over her challenges, we also witness numerous other changes. Debraj begins to succumb to Alzheimer's, first forgetting the way out of the Principal's office and then forgetting Michelle and leaving her stranded during an ice cream celebration for her improved typing. We also see Michelle reconcile with her sister Sara, who we find out was jealous of her parents' affection for Michelle throughout her life. After attending Sara's wedding, Michelle begins to wonder about love, which she has not experienced, and she even asks Debraj to kiss her on the lips. Debraj reluctantly does so but decides to leave Michelle on her own because of this demand and the position she has put him in. Twelve years after enrolment, Michelle does manage to gain her BA, and with her proud parents looking on her, she even gives a speech to the graduating class. Wearing no black graduation robe, she thanks her parents and her teacher and she announces that she will only wear the robe so that her teacher may see her first. Debraj is in a mental hospital due to his almost complete inability to remember his past and even how to speak. Michelle visits him wearing her robe and we see glimmers of memory return as Debraj realises that she has graduated and even does a victory dance. As the window opens to the rain outside, we see Debraj's hand in Michelle's reaching into the rain, and we hear the teacher-student pair say the first syllable of the word "water", with echoes of the scene in which Michelle first begins understanding the meaning of words earlier in the movie. However this time, it is Debraj who is beginning to learn to speak and understand. The movie ends with a scene of Michelle amongst a crowd of people all dressed in black carrying candles walking towards a church. There is a voiceover of a letter Michelle has written to Debraj's friend Mrs Nair explaining that today was her teacher's first day of school, and that like hers, his alphabet began with "B L A C K". Sanjay Leela Bhansali first came up with the idea for Black in 1995 while filming Khamoshi: The Musical. He was inspired by Helen Keller's autobiography The Story of My Life and visited the Helen Keller Institute to do research. He also read the autobiography of deaf-mute pianist Geraldine Lawhorn for ideas. Much of the film was based on his observations between students, teachers and parents at the Institute. Bhansali originally planned for the film to be a low-budget film in Hindi and English which would provide a change from his prior film, the expensive Devdas. A self-described "diehard fan" of Amitabh Bachchan since he was a child, Bhansali was able to cast him after Bachchan watched Hum Dil De Chuke Sanam and approached him about starring in one of his films. When Bhansali first approached Rani Mukherjee to play the role of Michelle McNally, she declined because she believed it was too challenging for her. To prepare for his role, Bachchan watched documentaries. Rani Mukherjee wore coloured contacts to give her the appearance of a blind girl and both Bachchan and Mukherjee studied sign language and Braille for seven months. A team of deaf-blind students were also on set advising the actors and instructing them in sign language. The film was shot in Mumbai and in Shimla. Parts of pre-independence Shimla, were recreated by production designer Omung Kumar, who later worked with Bhansali on Saawariya (2007), in Film City, Kamalistan Studios and Mehboob Studios across Mumbai. The sets of Black were closed to prevent details about the film from leaking. The cast and crew experienced many difficulties during the film's shooting. During filming in February 2004 a fire broke out at the 15,000-square-foot (1,400 m2) Mumbai set, destroying costumes and props. The fire was started in the night when a plug sparked and ignited. Bhansali was forced to start the indoor sets from scratch. Also, during the outdoor shoot in Shimla the script required snow but there was none so the crew brought in snowmaking machines from Mumbai and created a man-made snowy landscape. Permission to shoot at the Indian Institute of Advanced Study's Viceregal Lodge was initially denied, delaying the film further. Constantly on the sets of this movie was 'Zamir Dhale' – also a deaf-blind, proficient in tactile signing language. He stayed in Shimla during the time of the shooting to help Amitabh Bachchan and Rani Mukherjee understand the world of the blind and the deaf. He also taught them the usage of sign language and how to communicate with such people. The film's production budget was ₹23 crore (equivalent to ₹58 crore or US$8.1 million in 2018). Black was originally scheduled to be released on 10 December 2004, but Bhansali decided to postpone its release. Black was released on 4 February 2005 in 170 different towns in India, a small number compared to most large-budget Bollywood films. Black was also screened at several international film festivals like the Casablanca Film Festival. The film released in South Korea on 27 August 2009. Black was met with acclaim from critics . Amitabh Bachchan and Rani Mukerji won the filmfare critic's acting awards also, besides the best actor and actress awards. The performances of Amitabh Bachchan, Rani Mukerji and Ayesha Kapoor were especially praised by critics. Richard Corliss of Time magazine selected it as one of the best films of 2005. It was also listed at number one on the Indiatimes' list of 25 Must See Bollywood Movies. At the Indian box office in 2005, Black grossed ₹33.02 crore (equivalent to ₹84 crore or US$12 million in 2018), making it the year's ninth highest-grossing film in India. Its net income was ₹23.19 crore (equivalent to ₹59 crore or US$8.2 million in 2018), which was designated as an "average" financial success by Box Office India. The film was the highest-grossing 2005 Indian film overseas, and was the second highest-grossing 2005 Indian film worldwide. Black earned US$754,819 in the US and £473,862 in the UK in 2005. The original Hindi version of Black had an overseas gross of US$7.45 million. Its most successful overseas territory was South Korea, where it released in 2009 and drew an audience of 877,311 viewers, grossing ₩6,254,367,609, equivalent to US$5.88 million (₹25.66 crore). This includes ₩3.8 billion (US$3.36 million) grossed from 560,000 viewers in its first two weeks. Its final worldwide gross was ₹66.597 crore (equivalent to ₹169 crore or US$24 million in 2018), including ₹40.937 crore from the original Hindi version and ₹25.66 crore from the dubbed Korean language version. A. R. Rahman was originally roped in to score the music, but he had to refuse due to busy schedules. The film's music is composed by Monty Sharma. Unlike many other Bollywood films, Black has only one song, "Haan maine chookar dekha hain", performed by Gayatri Ganjawala. Black won the Best Feature Film in Hindi Award and Amitabh Bachchan received Best Actor award at the 53rd National Film Awards. Black made an all-time record at the Filmfare Awards by winning eleven awards, beating the previous record holders: Dilwale Dulhania Le Jayenge (1995) and Devdas (2002) with ten wins each. Black is one of the 5 films alongside Guide (1965), Dilwale Dulhania Le Jayenge (1995), Kuch Kuch Hota Hai (1998) and Devdas (2002) to win all of the four major awards (Best Movie, Best Director, Best Actor and Best Actress). ^ a b c d e f "Black – Movie". Box Office India. Retrieved 10 February 2018. ^ "The Mumbai Mirror : Entertainment / Cinema : Bhansali's Black Spins a Turkey". ^ "The Telegraph : Entertainment / Cinema : No fellow-maker should comment on a film in print". ^ "The Deccan Chronicle : Entertainment / Cinema : 10 'Iconic' Indian movies that were actually copied". ^ "'Black' draws huge crowd at IFFI". Apunka Choice. 27 November 2005. Archived from the original on 17 October 2008. Retrieved 15 January 2010. ^ a b Richard Corliss (23 December 2005). "2005's Best Movies". Time. Retrieved 15 January 2010. ^ a b Rachna Kanwar (3 October 2005). "25 Must See Bollywood Movies". Indiatimes. Archived from the original on 1 March 2010. Retrieved 15 January 2010. ^ "The Hindu : Entertainment / Cinema : Indian films a `nonentity' at Cannes". ^ "The Hindu : Entertainment Bangalore / Cinema : Cannes premier for Naina". Archived from the original on 4 February 2010. ^ a b Subhash K. Jha (18 November 2004). "Bhansali digs AB, Blacks-out Ash". Times of India. Retrieved 13 January 2010. ^ "A film from the heart". The Hindu. 4 February 2005. Retrieved 13 January 2010. ^ "Rani's given a magnificent performance in Black: Big B". Indian Express. 3 February 2005. Retrieved 13 January 2010. ^ "In search of Michelle..." Screen. 4 February 2005. Retrieved 15 January 2010. ^ Subhash K. Jha (11 January 2005). "`Bhansali guilty of exploiting the handicapped?`". Sify. Retrieved 13 January 2010. ^ Deepanjana Pal (September 2013). "Places Other Than This". The Big Indian Picture. Retrieved 6 December 2013. ^ Viral Bhayani (23 January 2005). "Salt used as snow for 'Black'!". Indo-Asian News Service. India Glitz.com. Retrieved 13 January 2010. ^ Baldev S. Chauhan (29 July 2004). "No to shooting 'Black' in heritage building". Indo-American News Service. India Glitz.com. Retrieved 13 January 2010. ^ "The wait's over". The Telegraph. 14 December 2004. Retrieved 13 January 2010. ^ "Black on Star Gold". Screen. 23 September 2005. Archived from the original on 23 April 2008. Retrieved 13 January 2010. ^ Subhash K. Jha (4 August 2005). "Rani Mukherjee honoured at Casablanca Film Fest". Sify. Retrieved 15 January 2010. ^ a b "영화 <블랙>". Daum (in Korean). 1 February 2017. Retrieved 10 February 2018. ^ Sita Menon (4 February 2005). "Black: Bhansali's passion, pain and pleasure". Rediff. Retrieved 15 January 2010. ^ Nikhat Kazmi (3 February 2005). "Black". Indiatimes. Archived from the original on 26 September 2009. Retrieved 15 January 2010. ^ "Box Office 2005". BoxOffice India.com. Archived from the original on 21 January 2008. Retrieved 15 January 2010. ^ "Black". IBOS. Retrieved 15 January 2010. ^ "Top Overseas Grossers ALL TIME: Three Idiots Number One". Box Office India. Archived from the original on 23 January 2012. Retrieved 21 January 2012. ^ "KOFIC 영화관 입장권 통합전산망 : 영화정보". Korean Film Council (in Korean). 2009. Retrieved 25 April 2018. ^ "작지만 감동적인 인도영화 <블랙> 대박 이유는..." Kyunghyang Shinmun (in Korean). 2009. ^ Savita Gautham. "inese rhapsody". The Hindu. Archived from the original on 25 February 2004. Retrieved 23 October 2003. ^ Priyanak Dasgupta (4 May 2005). "On a Song". Times of India. Retrieved 15 January 2010. ^ Subhash K. Jha (4 January 2005). "Bollywood is abuzz about 'Black'". Indo-Asian News Service. IndiaGlitz.com. Retrieved 15 January 2010. ^ "National awards: Big B, Sarika win top honours". Times of India. 8 August 2007. Retrieved 15 January 2010. ^ Bhuvan Lall (26 February 2006). "Black sweeps the board at Indian Filmfare awards". Screen. Retrieved 15 January 2010. ^ "10th Annual Planet-Bollywood People's Choice Awards!". Planet Bollywood. Retrieved 26 December 2008. ^ "Amitabh bags best actor at Apsara awards". Times of India. 22 January 2006. Archived from the original on 12 January 2009. Retrieved 26 December 2008. ^ "69th Annual BFJA Awards for the year 2005". Bengali Film Journalists' Association. Archived from the original on 11 March 2008. Retrieved 26 December 2008.